Anthony R Leeds. 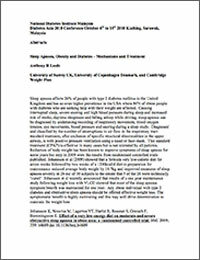 University of Surrey UK, University of Copenhagen Denmark, and Cambridge Weight Plan. National Diabetes Institute Malaysia Diabetes Asia 2010 Conference October 6th to 10th 2010 Kuching, Sarawak, Malaysia. Abstracts. Sleep Apnoea, Obesity and Diabetes – Mechanisms and Treatment.